Summary: A normally mild-mannered political analyst socks it to the lawmakers -- and the gas pump. 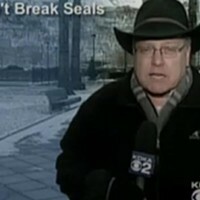 Station: KDKA Channel 2 Reporter: Jon Delano When it Aired: May 21 Running Time: 2 minutes, 54 seconds Visuals: * Some of Congressman Tim Murphy's famous mailing litterature. 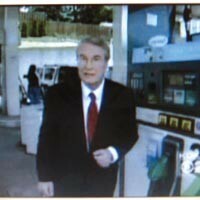 * A furrowed-brow, spittin'-mad Delano taking a broad swing at a gas pump and hitting it. Highlights: * Delano exclaiming, "There's a lot of anger at the pumps. But the question is, does anyone really believe [our politicians] will do anything about it?" * When Delano says, "Blame the oil companies all you want, but it's only the White House and the Congress who can make things right." * When Delano, in an uncharacteristic burst of passion, confesses, "If you're anything like me, you're so angry over these high gasoline prices that you wanna punch somebody. But who do you punch, the government?" * When an obviously jaded woman opines, "I usually blame politicians for everything, and I see no reason to change that at this point in time." * When a worked-up Delano asks Congressman Mike Doyle, "What are you doing in Washington to get these prices down?" * When Doyle responds, "I think there's two things we need to look at: What's the short-term answer and then what's the long-term fix? In the short term, I really think a close examination of what's going on with the refineries in the United States is in order." * When Delano explains, "Doyle thinks the oil companies shut refineries down to drive up the prices. Congressman Jason Altmire agrees." * When Altmire says, "[W]e can't overlook the fact that the big-oil industry is making all-time record profits. Quarter after quarter after quarter, they're setting all-time records for American business and profit." * When Delano gives up and says, "Well, there you go. With prices over three dollars, what's the congressman's answer? More investigation! It's pretty clear when you talk to members of Congress that they really don't have a short-term solution, and the long-term solution essentially requires years and years of preparation. And let me tell ya, they've been through this before. Ten years ago, 20 years ago, 30 years ago. It sometimes seems nothing ever changes when it comes to the Congress and the White House." What We Learned: Come on, Doyle, there's no long-term fix for anything. Unanswered Question: Why can't a politician ever answer a question directly? News Value: 8. Delano takes no prisoners. I just hope he didn't hurt his hand. Summary: A proactive approach to preventing unwanted postal deliveries. Station: WPXI Channel 11 Reporter: Stacia Erdos When it Aired: May 21 Running Time: 2 minutes, 52 seconds Visuals: * Junk mail falling on top of junk mail falling on top of more junk mail. * Erdos feeding junk mail through a shredder. Highlights: * When anchor Peggy Finnegan gives this statistic: "213 billion: That's how many pieces of mail the U.S. Postal Service delivers every year, and most of it is junk." * When Erdos says, "[E]very adult in the United States gets about 41 pounds of advertising mail a year. ... [This woman] gets mounds of junk mail at her Collier Township home. She considers the mail more than just an annoyance." * When the victim of unwanted junk mail says, "It's dangerous just to have 'em layin' around." * When Erdos agrees, "She's right. Every year, 400,000 people have their identities stolen through junk-mail theft. Pittsburgh consumer advocate Mary Bach says the most dangerous mailing is the pre-approved credit-card application." * When Erdos reports, "Bach says you do have the power to stop the junk mail, and it starts with one very important number ... 1-888-567-8688. [This woman] gave it a try. ... [S]he should see less junk mail in about six weeks. And in three months, it should be gone for good." What We Learned: To start looking for other numbers we can call to put an end to life's other annoyances. Unanswered Question: Papier-mâché, anyone? News Value: 2. If only recycling junk mail were as easy as recycling worn-out consumer stories. Summary: A procedure that claims to "dissolve" excess fat. Station: WTAE Channel 4 Reporter: Kelley Frey When it Aired: May 21 Running Time: 3 minutes, 8 seconds Visuals: * A woman baring her "belly pouch," or, if you prefer, "muffin top." * Before and after shots. Highlights: * When Frey blissfully buzzes, "After hundreds of sit-ups haven't helped, [and] counting calories didn't cut it ... [this woman] is turning to this: a procedure that promises to whittle away her waistline. Stars like Britney Spears swear by it." * When Stephen Mills, one of the first doctors in the region licensed by Lipodissolve, says, "Lipodissolve is a proprietary blend of a medication ... and a Vitamin B complex. It works as a detergent-type effect on the fat ... and you excrete it naturally out of the body." * When Mills proclaims, "Lipodissolve is finally the answer to the person that goes to the gym, diets, exercises and tries to get fit, but has one or two areas that aren't coming off." * When Frey discloses, "For about a day, [the woman's] tummy will look and feel like she was stung by a swarm of bees." * When Mills highlights the upside: "No downtime. You can be injected and go right back to work." What We Learned: News, thy name is vanity. Unanswered Question: How much does it cost? News Value: 1. Oh yeah, sign me up for anything tabloids say Britney Spears swears by! Lipodissolve is not an FDA-approved treatment in the United States, and there's no conclusive evidence it works -- facts Frey fails to mention during her infomercial.